So this was our first repeat race, however we did bump up the distance to an Olympic distance. It was tempting not to sign up for the 400 meter swim sprint, but this worked out well for prepping for Ironman Stealhead 70.3 next weekend. We love races that start outside of our hotel. And this was the perfect setup. We woke up nice and early, ate some peanut butter sandwiches and a banana and we were set. We brought all our gear down and were all done by 5:30am. It is a nice feeling to sit down and relax knowing that transition is all taken care of. However we would find out later that someone decided to setup inbetween us, yes we setup right on the outside of the rack side by side. I hate the swim, and this was no exception. The swim lane was pretty narrow and there was a lot of swimming over each other. After about 400 meters it kind of cleared up until each turn. 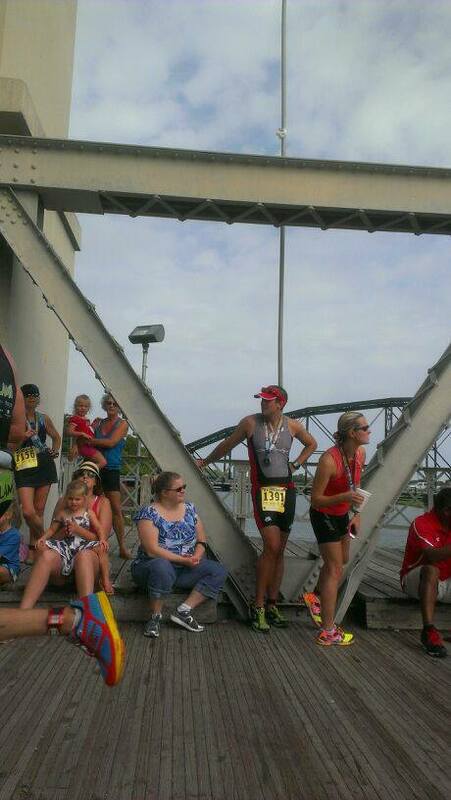 The swim was uneventful until about halfway through and a foot cramp popped up. There is not much to do but relax and flex my foot up. extending the toes out makes it a bit worse. I did have to flip on my back for a sec but the cramp was manageable afterwards. I finished kicking hard and clocked a time of 34 minutes, my fastest time by 40 seconds. I was pumped to have a Zipp disk and a 404 on the front for this race. It was 25.25 miles of really flat good roads. The shoulder had only a handful of bumps and holes, but overall a great course. The ride out was slightly uphill, but it was super fast. After changing directions I found out it was because there was a pretty decent wind rolling through. The ride back was tough with the head wind. I kept pushing and pushing remembering my previous time trials and how my legs felt afterwards. I knew even though there was burning I could manage it through the run. I passed quite a lot of people since y swim was a bit slow, and finished in 1:06. I was feeling good at this point and was ready to rock the run. I had forgot to bring a gel so I had to pack my soft flask I used on the bike in my back pocket. It was kind of awkward bouncing in my pocket, but it was definitely needed. I had heard there were some sneaky hills about 2 miles in that we missed last year on the sprint. So I was slightly cautious with my pace, but still pushing it. And when we hit the hills I was glad I did save some energy. We did about 262 ft of climbing on the entire run, I think about 80% of it in the middle 2 miles. These hills broke athletes. I saw many walking but I kept pushing uphill and downhill. There were a total of 3 hills, each a steep up and down, then we hit the same ones on the way back. After clearing the hills I felt much better and kept my pace up. 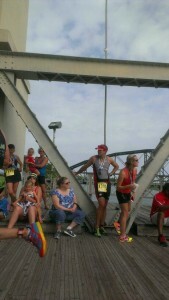 The final turn onto the finishing bridge was a giant relief. I pushed as hard as I could in the final few meters and barely mustered a quicker pace. The run time was 46 minutes…super happy. Great race, great support, 10/10, would race again.